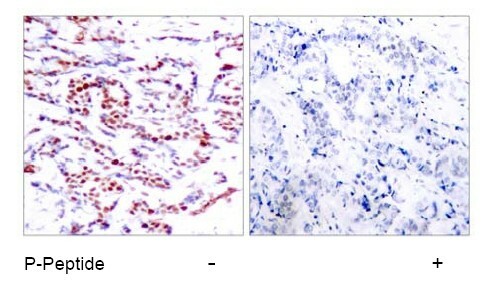 The antiserum was produced against synthesized phosphopeptide derived from human ATF-2 around the phosphorylation site of threonine 71 or 53 (T-P-TP-P-T). 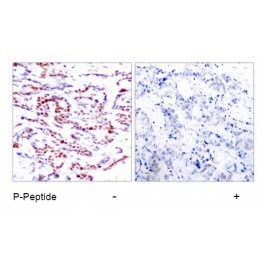 Suitable for use in Western blot (1:500~1:1000) and Immunohistochemistry (1:50~1:100). Gupta S, et al. (1995) Science. 267: 389-393. Van Dam H, et al. (1995) EMBO J. 14(8): 1798-1811. Phosphate buffered saline (without Mg2+ and Ca2+), pH 7.4, 150 mM NaCl, 0.02% Sodium Azide and 50% glycerol. 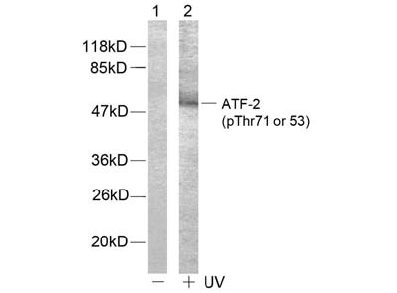 ATF-2 (phospho-Thr71 or 53) antibody detects endogenous levels of ATF-2 only when phosphorylated at threonine 71 or 53.